Wells Fargo CEO John Stumpf will forfeit much of his 2016 salary -- including his bonus and $41 million in stock awards -- as the bank launches a probe into its phony accounts scandal. The fallout from the controversy has also resulted in its first major executive departure. Carrie Tolstedt, who headed the division that created the fake accounts, has left the company ahead of her scheduled retirement at year end. Wells Fargo, under pressure from lawmakers and shareholders to take action, said Tolstedt will not receive a bonus or severance, and that she'll forfeit all of her $19 million worth of unvested stock awards. Wells Fargo also said Tolstedt has agreed not to exercise some $34 million in stock options, the bank's independent directors announced Tuesday. However, Tolstedt could still be walking away with a fortune despite running the retail bank during the entire time the unauthorized accounts were opened. Tolstedt owns roughly $43.3 million in stock outright that she accumulated during her career with the bank, according to a letter Wells Fargo sent to Senator Elizabeth Warren. That means if she is allowed to keep her stock options, Tolstedt could leave Wells Fargo with stocks and options valued today at roughly $77 million. Wells Fargo's board of directors also said Tuesday that it's launching an independent investigation into the company's sales practice. The new probe comes as employees told CNNMoney that the practice of opening fake accounts began years earlier than Wells Fargo has previously acknowledged. During the company's investigation, Stumpf will work for free. Stephen Sanger, the board's lead independent director, said the executives could face further penalties, depending on the results of the investigation. He said in a statement that the board may claw back additional compensation or take "other employment-related actions." It's not clear if that could include forcing out Stumpf, who Warren and others have demanded should resign. If they're cleared of wrongdoing, both Stumpf and Tolstedt may end up taking home some of their hefty pay packages. The decision to "claw back" Stumpf's and Tolstedt's compensation comes just before Thursday's big Wells Farg (WFC)hearing in front of the House Financial Services Committee and amid a string of embarrassing headlines about the opening of unauthorized accounts. Wells Fargo paid Stumpf $19.3 million in total compensation for 2015, in part as a reward for the bank's growing number of accounts. Millions of those accounts, as it's been since revealed, were fake. An intense focus from top management on adding new accounts, former employees say, led to a pressure-cooker atmosphere at Wells Fargo. Last year, Stumpf was awarded with $4 million for various factors that included growing "primary consumer, small business and banking checking customers." Wells Fargo also rewarded Stumpf last year for his success in "reinforcing a culture of risk management and accountability across the company." That bonus led Jeffrey Sonnenfeld, an authority on corporate governance at Yale University, to say that "without a doubt" some of Stumpf's pay should be clawed back. "He should be docked," Sonnenfeld said. A CNNMoney analysis, conducted prior to the clawbacks, showed that if he were to leave, Stumpf could leave Wells Fargo with about $200 million of cash, Wells Fargo stock and options. Last week, Warren slammed Stumpf for "gutless" leadership, in part for his refusal to cut compensation for Tolstedt, who led Wells Fargo's community banking division during the entire time fake accounts were created. 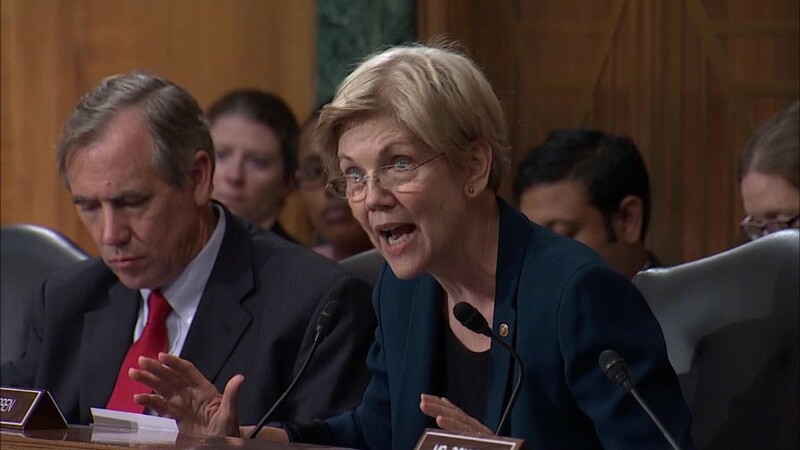 Warren also came down heavy on Stumpf on his own pay: When it all blew up, you kept your job, you kept your multimillion dollar bonuses, and you went on television to blame thousands of $12-an-hour employees who were just trying to meet cross-sell quotas that made you rich."